With Apple’s Siri taking the voice controlled services world by storm and proving that you can actually get a decent working piece of software that can enhance the way we work smartphones and mobile devices, it was only a matter of time before competitors surfaced and tried to muscle in on the limelight. 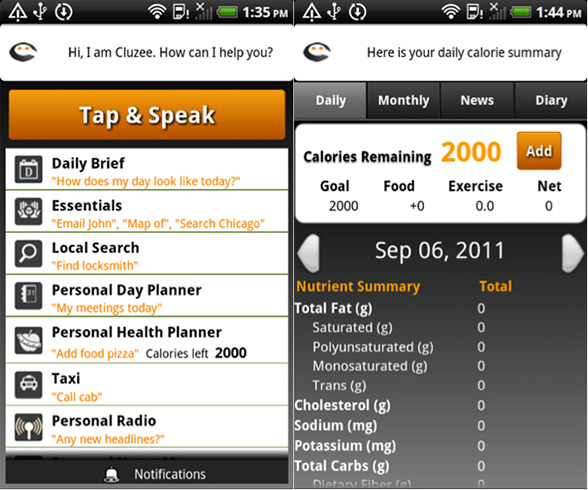 This is Android’s first real Siri competitor in the form of Cluzee, which is marketed as your “intelligent personal assistant” and if the video demonstrations are anything to go by below, it looks like Cluzee has some pretty nifty tricks up its sleeve and certainly seems to have a few positives over Siri currently. For instance in a demo used when asked “What does my schedule look like today” the software not only runs down the usual itinerary that Siri can offer, it also pulls in data from mapping programmes and online data that can potentially warn of roadworks while out and about on that schedule of work. As a personal assistant more than a voice controlled helper, it can also find bargains, read your emails, and find flights, book restaurants etc among other pretty clever functionality. We already reported on the fake Siri for Android app on the Android marketplace well readers of that article may be glad to know that this application is available in the Android marketplace, with the company behind the application, Tronton, looking to add a cloud based version in the near future. It does however seem like the app has pretty average reviews by and large! What do you think of this kind of software, is it the next logical step forward in the evolution of computing, I personally thinks it will be huge and will change the way we work our devices, and also hopefully aim to eradicate unnecessary RSI….I look forward to testing the application out soon and doing a review, so stay tuned.